Envirotex Lite hardens to a high-gloss finish, and cures completely in 36 hours. 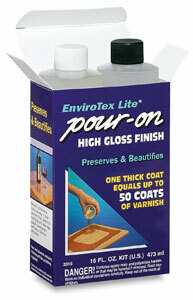 Use it to create a hard lustrous finish for table tops, plaques, clocks, figurines, and so forth. Instructions are included. ® Envirotex Lite is a registered trademark.